There was a bunch of us riding all the horses tonight before the rain comes. I introduced Mort to lunging tonight and he was quite good and handled the side reins nicely. http://www.youtube.com/watch?v=mTExcRYFZtM is the direct link to his little video. He wasn’t quite sure about the whip but he tried hard. I just went the easy direction for his first session and kept it short and simple. He is a quick learner so no doubt he will pick it up quickly. I got a good chuckle tonight when I walked Mort out to the ring and Kurt came out to do some pictures. Amy’s husband, Jeremy, said “I take it these are before pictures.” Ha, yes very much not so attractive at the moment BUT I have been doing this a very long time and this horse is something special. Uphill, athletic, three good gaits and a good brain. 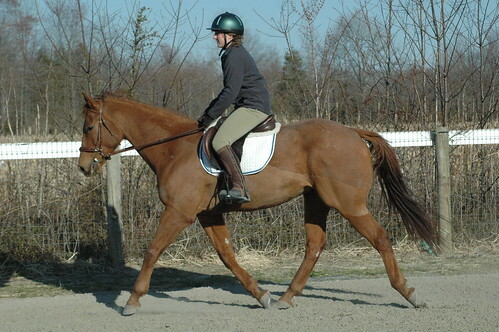 He simply needs a reshaping but you can do wonders on a horse like this. His neck is attached in the right spot but the muscle has to be rebuilt. He is a big guy at 16.2 but lanky. He gained weight at the layup farm compared to what he looked like at the track but he is now on the skinny horse program. Powerpak, TC senior, rice bran and all the alfalfa he will eat. Then the good old start to teach him to round his back and stretch down program so he can build topline. It will take time but he is very much worth it. Something special about him that I can’t put my finger on but we shall see. 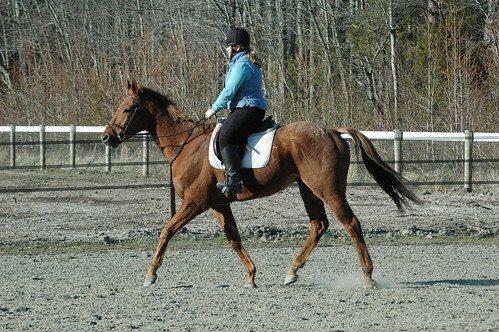 Perhaps it’s because he has a canter like this? I know I always talk about what a good boy Diamond is but he once again proved that he is a good ammy horse tonight. Amy was riding and jumped the gray arched walls for the first time and he was totally game. She came in a bit slow so he popped it but he tries so hard! Has anybody else been experiencing extra silly horses? Perhaps it was the fact that we went from 70 degrees back to 30 degrees but the CANTER horses are being a bit silly at the moment 🙂 Mostly in the field where they are running around like loons and spooking at every little noise. I opened up my front field which has gorgeous grass and they were too scared to go up there. Kurt and I took them up and let them loose and they went OMG so scary and went flying back to the barn. Really??? Green gorgeous grass. Whatever. I found them in the front field this morning (connects to their main field) so I suppose they figured it out but 5 min later I hear them go tearing back to the barn. Such silly boys. It shall pass but Kurt was sad that they were tearing up the nice grass. Horses…it’s just what they do. It has been slow for the CANTER horses right now. Shoes is resting and his splint is looking much better. He is super angry at me that he is confided either to a stall or small paddock and can’t join the others in their daily rough housing. The inflammation is gone from the splint and he is much sounder so it’s just a matter of time before he is back in action. I was waiting for Mort to get some shoes on as his front feet were cracking but the farrier was out so he is now good to go. Diamond H is doing well but I am sort of waiting for the dentist to look at him before cranking up the work too much. I had the chiropractor out on Friday to work on everyone on the barn. Mort needed the most adjustment but that is what I expected since he has not been done before and has just been hanging out in the field. She thought Shoes felt super and remarked how nicely he had muscled. Diamond also felt good just a tiny bit of adjustment in the sacro area. I am going to start Mort today with some lunging (I have ridden him but teaching him to lunge with some side reins will be great) to build up his muscle. I meant to get some pictures of him this weekend but Kurt was really busy with farm projects so we didn’t get much video or pictures done. Not to mention it was cold!!! We had a really fun weekend exploring new trails and I actually rode my own horse several times and got to work on some jumping. He also is the best snuggler around and has a habit of doing the cutest damn things that make me love him more each day. His latest cute thing is that when I come out in the mornings he is always sleeping. Sometimes he is laying down in his stall or out in his paddock. He waits for me to dump his grain in his bucket and takes his time getting up. Then he has to do a big stretch and then all of a sudden he is hollering like a fool. Ha, dude your grain is in the bucket so nice of you to wake up. This morning he was laying down in his stall as I have been stall resting him. I came in and both Shoes and Mobster were sleeping. I waited to get out the grain cart and instead walked into Shoes stall where he proceeded to look at me with his sleepy eyes and he let me come in and love on him a bit. Wouldn’t you know that lazy horse didn’t even get up until I got to his stall (4th stall that I fed) and put his grain in. I suppose he doesn’t feel the need to get out of bed until the food is in the bucket. Hilarious! I have been having great rides on Diamond H. He is getting much stronger in his body and we are able to get the right lead using the pole to help him strike off. The chiropractor is coming tonight for the whole barn and I think that is going to help Diamond out. Mort also doing super well. He is going to be an eventing machine (I think he will) so I am eager to get him out and about. He is getting some shoes on this weekend so I can start trail riding him to build some muscle. He has just been hanging in a field since October so needs to get built up. I have been super busy right now as I have a bunch of horses to ride each day. I have Gracie, Junior, Mobster, Mort and Diamond on the schedule right now. Shoes is resting while the splint cools down. I tend to get three of them ridden a day and if anybody is left out it’s my own horse. Gracie, the lovely cleveland bay/tb, will head back to her owner the middle of April. She has come along so nicely and I can’t wait to follow her career. I hope to do some eventing with my OWN horse 🙂 Kurt has been doing all of the riding on him and we go out trail riding 3-4 times a week with the babies. I was just laughing with my mom over how amazing Junior has turned out to be. I NEVER thought that he would turn out to be an absolute packer and that he would be the ultimate hubby’s horse but he sure has. He is a fantastic lead horse for all the babies and will go through any kind of footing, water, ditches, banks and he remains cool and calm even when the horses around him are being silly. He sure earns his keep! Show season is right around the corner. I have been adding a bunch of stuff to the calendar paper chases, dressage shows, combined tests, jumper shows and events. Can’t wait to get out and about. Now the weather needs to warm up again and dry out! I couldn’t find the reason behind the lameness until today when the vet arrives and feels down his legs to find a fresh splint. Really, it wasn’t like that before so we probably made it worse riding him the past two days especially our 30 min walk down the road from the trail yesterday. He was super ouchy on it so tonight he got cold hosing, bute and dmso/cortisone. The good news is that splints are minor and he just needs a bit of rest before he is good to go. I am sure he probably knocked himself in the field or something being silly. He is going to have to get some solo turnout until he heals up. I have no picture or video proof at the moment but I am sure there will be some soon. Diamond continues to prove that he is cooler than cool. I have been working his flatwork and he is really stretching down and we now are able to pick up the right lead with the help of a ground pole. 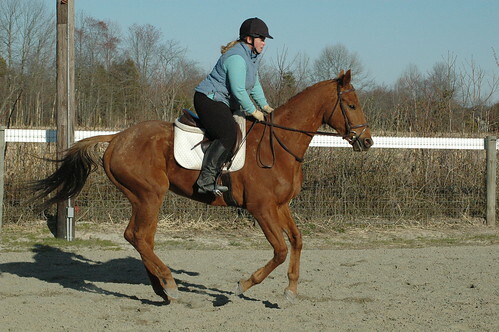 I come at the pole on a diagonal and opening inside right rein and strike up the canter over the pole. He is smart and figured that out really quickly. 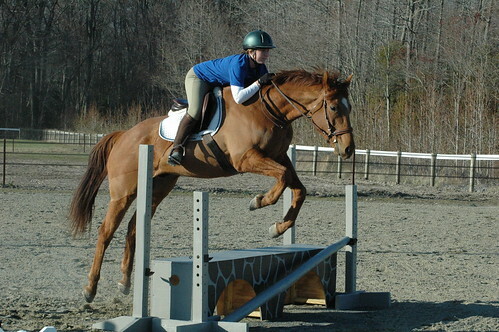 Amy came out on Friday to ride him on a beautiful 70 degree day and asked if she could do a bit of jumping. OMG!!!! He was so good and is now actually jumping and has a great front end. He doesn’t even look at the jumps no matter how scary they are. He did the little grid, gates, scary panel, flowers and more. Amy is in love with Diamond and probably would buy him if she didn’t have to move around every few years and do so much traveling. She fits him perfectly and every time she gets off she has a huge smile on her face. She couldn’t get over how quickly he learned to jump. I figure we have jumped him a total of 4 times now and he went from barely picking his feet up to having a lovely jump. I hope to get him out x-c here within the next week or so. Shoes was going out of this world amazing. I had someone who reads the blog and had seen/read all about him and sounded like a perfect match flying in for the weekend. I am riding him on Wednesday and he is not quite right. OH NO! I did the bute test and no better on Thursday. I lunged him and did some video and sent it off to her to let her decide what she wanted to do. She opted to go ahead and fly down as she liked the horse and he wasn’t that lame. We had a nice ride in the ring on Saturday and took a long hack out yesterday. Kurt, Jill and I went out and we had a fun w/t/c and then hacked down the road with all sorts of vehicles passing including motorcycles, jumped some ditches, went through water and did ditches filled with water. 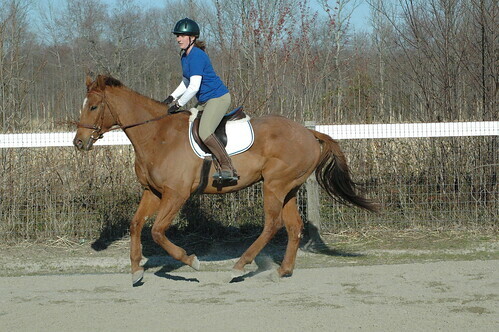 She loved how brave and smart Shoes was and how he nicely navigated the water and ditches w/o leaping over them. He stood quietly while I tried to convince my young horse that she could go through the water. She wasn’t convinced so we had to walk down the road some more. I will address that another day. Shoes still isn’t sound so of course we are going to get to the bottom of that. I am hoping for an abscess from his week w/o a shoe and all the wet weather. Damn horses! She was very complimentary of Shoes and loved how he felt undersaddle which always makes me feel good. He does give you such a great feel and is soft, forward and straight between the aids. 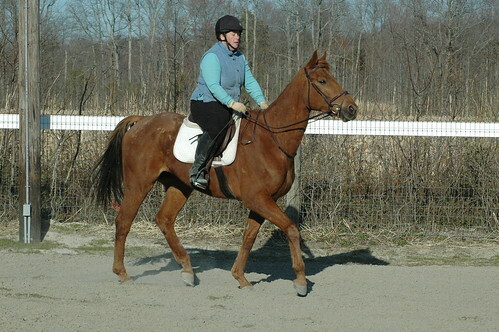 His canter has come so far and overall he is just stronger in his body. He has gain so much confidence as he has went along and I can’t help but to be proud of his progress. It has been a very busy weekend but a fun one. I really enjoy getting to meet new people who share the passion for young horses and especially those who love and appreciate the Tb’s. Ha, can I just tell you how much I like the name Mort 🙂 Mort Robbins, was a horse that I saw during our track visit and fell in love with. 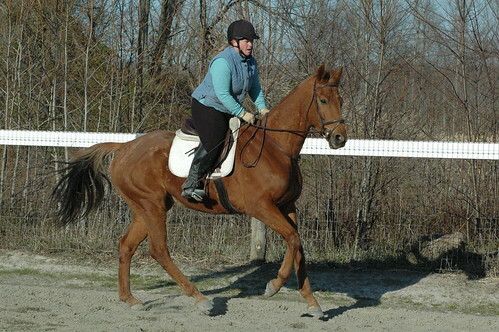 He is a big 16.2 h now 6yr gelding and just sort of plain chestnut but screams athletic jumping fool. He didn’t sell off the listings and his trainer asked if we would take him and he was in my trailer before he could reconsider 🙂 Did I mention I like Mort? I was even more excited when I saw him move. Yum! He has just been hanging out at the farm but I brought him home over the weekend to see if he was ready to get started. Our first ride was beyond hilarious in not such a great way. My ring is not currently fenced although it does have boundaries on all sides. No gate near the barn and the top is open. I was just telling Kurt that our next project would be to fence the ring totally in and fence in our small paddock that we use for a free jump area (horses kept jumping out of the fence that was over there!). Kurt was sort of doubtful that I really did need this fencing project done but Mort showed him why it may be necessary. I got on and was taking a nice walk around and looped back around near the barn and boom I was going backwards quite quickly. Wow, that was interesting. Kicking, turning and nothing is happening. I did have my whip but he was all nonchalant about that going nah nah nah going to the barn and you can’t stop me. I tried various methods of only using one part of the ring but that wasn’t necessarily working either as he would drop the shoulder and spin each time we got to that side of the ring near the barn and then do the running man backwards. Kurt is a horse trainer..wait you didn’t know??? Well have no doubt Kurt has watched enough that he is my armchair quarterback. He picks up the lunge whip and we come up with a plan. He stands in the corner of the top of the ring with the lunge whip and lets Mort know that he is not going that way. It took a few taps which Mort was pretty chill about and suddenly we were in business. We did a few changes of direction and told him how smart he was and let him think that it was his idea that he was such a good boy. Wouldn’t you know that our next ride was quite good. He is a smart horse! He did not need anyone to stand in the corner and although he drifted that way he did not protest when I kicked him forward. We did some w/t/c, some trot poles and even jumped a little gate. Good boy! I always say that horses keep you guessing and always test out just how good you are at using the tools in your toolbox. I had one horrible ride on Shoes last week when I was dealing with a horrible cold and I think he was taking advantage of me. Our next few rides have been simply amazing and it is hard to stop smiling. He is just such a fun horse and really easy for me to ride. I’m not that tall so the shorter compact horses just fit me really well. I feel like he was made for me and his style is exactly what I like to ride. 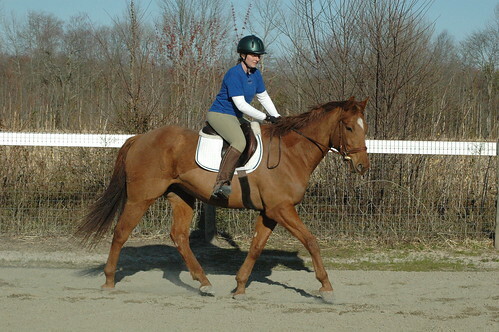 He is so soft in the bridle, moves well off the leg and has three nice gaits. He has a lovely balance and the canter has been amazing. He is now jumping little jumps and is super brave about it all and very relaxed. He still has little moments but that is what makes him fun. I know..I just don’t like boring horses so a little spice is not a bad thing to me. Diamond is also going well and has been doing some hacking out on the trails. Kurt rode him on the trail last week and he was really good. Kurt thought he had a huge trot which he does. I have been working with him in the ring to teach him to stretch over his back and he is getting much stronger. Both Diamond and Shoes are getting so fat. Diamond has to be the easiest keeping big horse I have had. I have him on just a ration balancer but I suppose the unlimited alfalfa/orchard grass hay is the key because they look good and are getting fat/shiny. Looks like a gorgeous weather weekend and I hope to get some new pics/video of everyone now that I feel a bit better.